Amaltea has had many adventures and has made many friends all over this alternate world. Here you will find many of her friends. so others may live in the light"
An oath taken by a scant and hardy few of the elven court in the Land of Eternal Summer. A company of warriors who have given up hearth and home in elven society and embraced the shadow in order to watch over and defend the lands of the elves against the agents of darkness. Called upon for endless vigilance, these elves bear the mark of shadow, living in the twilight between the Land of Eternal Summer and the Land of Eternal Winter and the realms beyond. 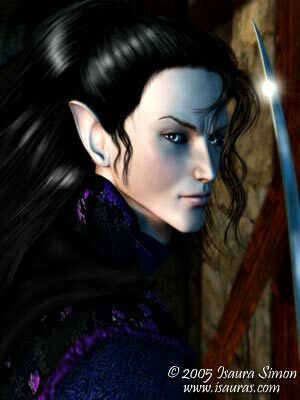 His hair, once pale silver, changed to the color of shadow, his "shadowmane", which will forever mark Aelric as one of those who ward against the dark. In his journeys, the tall, slender elf has journeyed far and farther still, eventually coming into the lands of Rhy'Din where he resided for a time. After allying with Amaltea and Xenograg against the threat of the Ward wraiths, the elf chose to accept the burden of going through the rift in the Ward created by Shakira. His journey takes him into the realms beyond the Ward, to chase down the escaped wraiths and help to heal the Ward of Gondar once and for all.